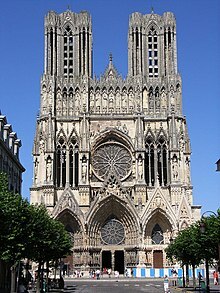 Notre-Dame de Reims (Oor Lady o Reims) is the seat o the Airchdiocese o Reims, whaur the keengs o Fraunce wur crowned. ↑ The last coronation wis that o Charles X, on 29 Mey 1825. This page wis last eeditit on 11 Mairch 2018, at 00:41.